Today is a rainy, stormy, Monday. 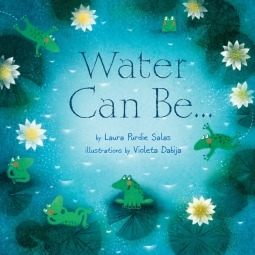 It is in fact, a day to enjoy Laura Purdie Salas’ Water Can Be… This lovely book is a perfectly written poem extolling the virtues of water. When we are sometimes drawn into complaining about the rain or grumbling about the ice or snow or fog, it’s good to remember the rich gifts of water. Laura Purdie Salas reminds us of these with her words. She captures the essence of water through spring into summer and fall into winter. Savor the phrases ‘tadpole hatcher’ ‘otter feeder’ ‘rainbow jeweler’ ‘fire snuffer’ and ‘salmon highway’. The cover art by Violeta Dabija draws you into a world of water with its playful frogs and lilypads. It would be impossible to choose a favorite, but I must say I do love the winter spread for ‘Storm creator, Decorator’ where we see the effects of frozen water blowing in the air and clinging to the bare tree branches on the city streets and from inside a warm and cozy home through the frosted windowpane. Beautiful! Then again, if I could purchase just one page to decorate my wall it might be the whimsical otter clutching a fish. Do yourself a favor and pick up a copy as soon as you can! I just learned of this today, Laura Purdie Salas is sharing a percentage of her royalties from the sales of Water Can Be… with Water Aid, a non-profit organization dedicated to making sure children everywhere have access to clean safe water. You can learn more about this at her website. Eric Carle has long been a favorite in our house. My children cut their teeth on his books. My 3 year old granddaughter can ‘read’ Brown Bear, Bear all by herself. Of course, she will only do this while sitting in your lap (smart girl). My 15 month old granddaughter was dressed in a Very Hungry Caterpillar knit baby outfit for her first Halloween. And today, I picked up a copy of his newest book Friends for my son who just got engaged. The artwork is amazing! Naturally. It’s a beautiful story of a young boy who’s best friend moves away. He is so lonely that he decided to go find her. He swims through oceans, climbs mountains, travels through forests, and finally goes through a flower garden where he gathers a bouquet and finds his friend. “I knew you would come,” she said. And they got married. On the last pages, Eric Carle shows the reader a photograph taken of him with a little neighbor girl when he was only three years old. That photo is the basis for the cover art. When he was six years old, he and his parents moved back to Germany and he never saw his friend again. But years later, he married his wife Barbara who was one of the primary inspirations for this book. Awww, I’m a sucker for a good love story. I guess that’s why I immediately thought to buy this book, not for one of my granddaughters who love picture books, but for my son who loves his best friend. Gotta go now, my eyes are a little wet. 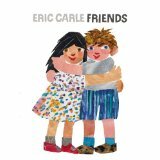 Oh yeah, before I forget, here’s a nice little youtube of Eric Carle talking about his new book. You watch while I get a tissue. See you around the blog! 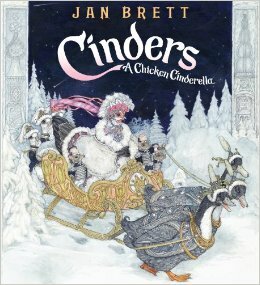 Jan Brett’s new picture book was just released yesterday. I guess that means another trip to the bookstore! I know, I know, I can order it online and have it delivered right to my door…. but what’s the fun in that? $70 spent yesterday (you’re welcomed B&N) and now another trip back tomorrow. Honestly, if I don’t stop all this book buying, I may have to go back to work! Seriously, you know how beautiful all of her artwork is. It just captures the reader (and listener) and immerses them into the world of the story. I always hate when I get to the end of one of her stories, because I have to leave her world and come back to reality.